Question: We spoke about the fact that we have to return to the level of unity that we attained in the December convention. It has been more than a month, the days go by and personally I feel that I am moving backward, sinking into the daily routine. How can we build an environment that will constantly evoke in me desires that are aimed at unity and the Light as it was in the convention? Answer: First, do you really want to return to that level? Do you yearn for it? Do you see it all the time as a model before you in order to keep the point of unity? Do you watch the recordings from the convention again and again? Are you sorry that you’ve lost that burning fire? If we had kept the connection, we would have already attained a much higher level, and would have risen above all the interruptions and the distances that separate us. I must constantly renew the forgotten feeling, at least for a couple of minutes a day, for example, to see a short clip from the convention. I think it is very important. Besides, are we working on disseminating our message? Do you take this into consideration in your work? We must join it and distances are no obstacle here. You must connect to the point, to make a plan for mass dissemination in every language. Besides, in a month we are planning to go to the Arava again and to stay there for about three days. This requires great preparation. Otherwise the results will be the opposite of what we expect. It has to be something that is truly new, like it was the last time. We must make sure that we arrive there worried and anxious to enter a new state not knowing what it is and what fruit it will bear. I am very concerned about this breakthrough into the unknown. We already know the place, and because of the habit we may repeat the same actions and feelings that we’ve already experienced. The atmosphere itself will remind us of them. In short, a month isn’t a long time. We must make an effort to prepare ourselves as best as we can. Otherwise, instead of gaining we will lose. I am warning you about that. Start thinking what to do. We are part of an integral global nature. It has always been this way, but we have never thought about it and didn’t notice it as long as life didn’t oblige us to. Lately life obliges us to do that more and more: We have begun to receive blows in every direction. In other words, we cannot manage this egoistic life of ours and we don’t succeed in anything: not in the family, not with the children, not with ourselves, not with the world, and not with security. We are not sure whether we have enough stored up for a rainy day and the pension and retirement funds are collapsing. All the systems that have provided man with comfort, confidence, and security for the future, that helped him and his loved ones with the assurance of support in times of weakness, illness, or old age, are losing their value and disintegrating. Who knows, tomorrow we may find ourselves on the street, penniless with nothing in our bank account. If we examine things correctly, we will see that we ourselves have built the wrong systems. After all, being part of nature, I can’t do whatever I feel like; I can’t act randomly not taking into account the forces that operate in reality. According to my level of development, I discover wider and finer things in nature. They were hidden and now they are gradually being revealed, and I discover the strong mutual connection between all parts of nature, and also the mutual connection among people, the mutual bestowal on many levels, and also nature’s bestowal, which in turn influences us. So it may be that I am not taking into account the data, the laws and relationships that exist in nature, in me, and in human society that are hidden from me? I never took any interest in them because I used anything that came my way indifferently and carelessly, seeking only to profit from them. There is a problem of how to study these laws? After all, no matter what we study in nature, in physics, chemistry, biology, zoology, botany, or astronomy, on the micro and macro and all levels of nature, we always see one law that encompasses all the levels and that reigns between them: the law of equilibrium. All of nature tends toward equilibrium, toward balance. This includes our little system the planet Earth. This means that if we want to live in peace, tranquilly, and good connection with other people, with the family, etc., we must maintain a balance. Our formula should be that all the positive and negative actions in receiving and bestowal be balanced so that one will not exceed the other and so that each one will receive filling. Then each one will have the right to exist and no one will take precedence over another as we all understand that we all must maintain overall balance. This applies to all parties to the forces of nature—to man’s forces, his desires and thoughts, to the well being of the whole system both the small private system and the integral global system—all depends on the internal balance among all its components. We see this when studying global nature and the functioning of all its systems, including computer systems, cybernetics, sociology, psychology, physiology; even while a system develops, it constantly balances itself dynamically and is sensitive to imbalances that need to be corrected. Therefore its development and actions will always be successful because it is always operating with the law of equivalence between all its forces, the negative and the positive ones. Whether it is an atom in which the protons and electrons have to be balanced, or living cells, or the solar system: Everything abides by this principle. So, of course, we must check our adaptation to this law in the family, in human society, in education, and in general in all that belongs to the human level. In the News (from the Centre for Research on Globalization): “The expansion of world capitalism (globalization) depended on a global cheap labor economy. “The development of industrial colonies in the Third World resulted in the relocation of industries to these countries, leading to job lay-offs and the outright closure of a wide range of productive industries in the developed countries. “In the absence of meaningful state regulation, this relentless process of minimizing labor costs led to a dramatic compression of society’s capacity to consume. “The exploitation of the huge labor forces in China, India and elsewhere — and the pillage and transfer of billions from ex-communist Russia and ‘neo-liberalized’ South America — filled the coffers of old financial institutions. “Huge surplus profits spilled over into finance, real estate, and insurance, giving capital greater social and political power. This dwarfed the organization of labor, limiting its bargaining power and multiplying profits. “The state and state policy became their instrument as public enterprises, land, resources, and banks were privatized. “This speculative onslaught, a worldwide scramble to appropriate wealth through financial manipulation, has been the driving force behind the crisis. “The incapacity of the capitalist system to reinvest capital in productive ways led to large scale growth of speculator capital in many forms. “Real estate speculation was extended into the working class as wage and salary earners took advantage of easy loans to join the speculation frenzy based on an ideology of irreversible rising home values. “Having caused the financial meltdown, they have cashed in with windfall gains through the bailout money provided under the Bush and Obama administration bank bailouts. This has furthered their control over the real economy, by buying up and acquiring real economic assets; as once highly profitable companies collapse, the money managers pick up the pieces. “The Bush/Obama bailout measures will contribute to a further destabilization by transferring large amounts of money at taxpayers’ expense into the hands of private financiers, resulting in a spiraling public debt and an unprecedented centralization of banking power. “State-owned assets and everything under state jurisdiction is up for private acquisition as the financial establishment calls for the restructuring and privatization of state assets. My Comment: All this should explode, and the outcome depends on the awareness of what is happening. Undoubtedly, the entire system of social and economic relationships has to be re-built. But this is impossible to accomplish without a completely new approach to the meaning of the existence of society—for the sake of accumulation and consumption (an imaginary fulfillment through wealth) or for the sake of moral ascent (a feeling of reciprocity and love). Nature (the evolutionary development of people and society) pushes us to unite. The awareness of the need allows a smooth transition to a new level of existence. Will humanity understand this? My Comment: These are attempts to solve the problem of unemployment. But what will people do in their spare time if they are not busy with integral education? This will lead to their degradation! Besides, a shorter work week will reduce their income, and how will they make up for it? There must be fulfillment—either by alcohol or a new integral consciousness. Otherwise, this initiative will bring even greater social problems. In the News (from The Huffington Post): “Three researchers put forth a study that was published on Wednesday on the Public Library of Science website saying they’ve found that men and women feel and behave in markedly different ways. They’re almost like ‘different species,’ Paul Irwing, one of the researchers, told The Huffington Post. My Comment: According to Kabbalah, men and women are completely different because their roots are in the opposite worlds: Men are in Zeir Ampin, and women are in Malchut. Hence their lack of understanding of each other. Unity is possible only in at the degree above them both and only in mutual integral combination (mutual guarantee). This can be achieved only through the joint integral upbringing. That is why we see today such dramatic estrangement of the genders. It will make us feel the need to agree with the method that facilitates closer relations, proposed by integral upbringing. Opinion: (Dominique Strauss-Kahn, former IMF Chief): “Former International Monetary Fund chief Dominique Strauss-Kahn …sharply criticized Europe’s handling of its debt crisis and predicted as many as seven years of subpar European growth unless the Continent’s leaders changed policies. “Strauss-Kahn, who attended an economic conference organized by NetEase, one of China’s leading internet companies, stressed that European nations make up 25% of global GDP. If their economy stagnates, the whole world will be influenced, including China. “He proposed that China should offer direct or indirect assistance to soothe the financial crisis in the eurozone via the IMF. At the same time, he said the IMF should raise China’s voting power in the organization. My Comment: China will not help the EU and neither will any aid, which will simply disappear as in the abyss because this crisis is not the crisis of economy, banks, or state competitiveness, but a demonstration of the lack of correct connections between people. And it will not be over until mutual guarantee is established between people, nations, and the EU countries. Question: What can I do if a large part of my thoughts is devoted to material matters: how to earn money, my family, and my position in the eyes of people, and I hardly think about spirituality? Answer: This is great if you already know that all your thoughts are only about yourself and you do not agree with this, but cannot do anything. At this point you already have the opportunity to discover that there is one additional force besides yourself, the teacher, the group, and the whole world. There is a hidden force, which creates this egoistic relationship between you and the others, and only it can change this relationship to the correct one. You lack only a thought, a scrutiny: Is it necessary to change this relationship? Why do you need it? You do not have enough awareness of how much you want to win it and cannot think about anyone else but yourself, and that you cannot stand that you cannot overcome these thoughts. Then, from this inner feeling that has reached a huge tension, a cry is born, to which the reforming Light responds. 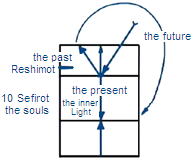 Our livelihood is measured by the ratio between three Lights: There is Reshimo (reminiscence) of the previous state; there is the inner Light and the surrounding Light in the present state with the Masach (screen) between them that separates the Light that comes to these two Lights. The inner Light gives us the feeling of the present. The surrounding Light, which remains because of what we cannot overcome in order to bestow yet, gives us the feeling of the future. The Reshimo, the basis on which I make this calculation, gives me the feeling of the past. My uncorrected egoism is what divides time into past, present and future for me. If I receive a Masach of 100% for all my desire, I no longer experience different times. The concept of time ceases to exist and only the world of Ein Sof exists. This means that the past, present, and future don’t exist by themselves! We have simply become accustomed to perceiving and feeling these influences this way, but this is only a psychological problem. There is no time; there is only the state of the soul, which feels the influence of the Light that constantly changes. This is why it seems to us that time passes. When I move from the concept of corporeal time to the spiritual one, to the ratio between the Reshimo, the inner Light, and the surrounding Light, which determines the past, present, and future, I begin to relate to this condition differently. It becomes clear to me that time doesn’t exist, and it all depends only on me. I can hasten time if I hasten myself and approach the present from the past, and from the present, approach the future more and more closely. It all depends only on the speed in which I acquire the Masach, develop it, clarify my situation, and perform actions of in order to bestow in the ten Sefirot of my soul. This is all our work because there is nothing else we should do but hasten time. If we “press the gas pedal” ourselves, we advance quickly and shorten our way, and make it pleasant, leading toward the desired goal. Then we go through it with joy and pleasure as we justify the Creator and thank Him for being good and benevolent, for arranging such a wonderful path for us. But if we don’t make enough efforts in order to advance, if we don’t press the gas pedal, but rather are pushed from behind by sufferings, we advance in the natural pace of evolution when everything happens in “its time.” Therefore, this advancement is felt as unpleasant and brings about great sufferings because the Light that comes doesn’t find desires that are ready to receive it and so it is compelled to remain outside and to pressure us and cause us pain and sufferings. In this case, all the Light comes without “sweetening” but as is, and so it is revealed as Gevurot, as burning fire. Everything comes from the Light, but it can be received by desires that are ready for it and that summon it, and it can come according to the natural process, in its time. So the main thing is to hasten our work. We see that on the human level, even an approach based on the best intentions will not allow us to reach truth and peace. There will always be quarrelsome people who will disturb the process. What can be done? Nothing. Human society and human nature were intentionally made this way so as not to allow us to get along in life. We can acknowledge the fact that it isn’t in our power, but not more than that. How much bloodshed and suffering is needed until we realize that we cannot have the minimal correct social relations among us? Nature is being revealed to us as more and more global and integral, connected and mutually dependent, and it gradually shrinks that “small place” in which we can continue to exist in the old egotistic form. The new laws are getting closer by leaps and bounds. In order to compensate for what we cannot achieve without unity, society is using different charitable organizations, but we will soon see how this “charity” is actually leading us to destruction. Baal HaSulam says that the destruction will actually come from those who try to make peace. There is only one solution to the problem: educating people to live in mutual guarantee. Thanks to this, humanity will be able to feel that there is something solid we can rely on. We can achieve this by creating the right environment. In addition to teaching and acquiring knowledge, education should include special activities by which the environment influences people. If we begin to organize such an environment, the internal forces to create it will be revealed through us. Without this there is no hope for peace.